It is notoriously difficult to make quilting designs on borders sweep beautifully around the corner. 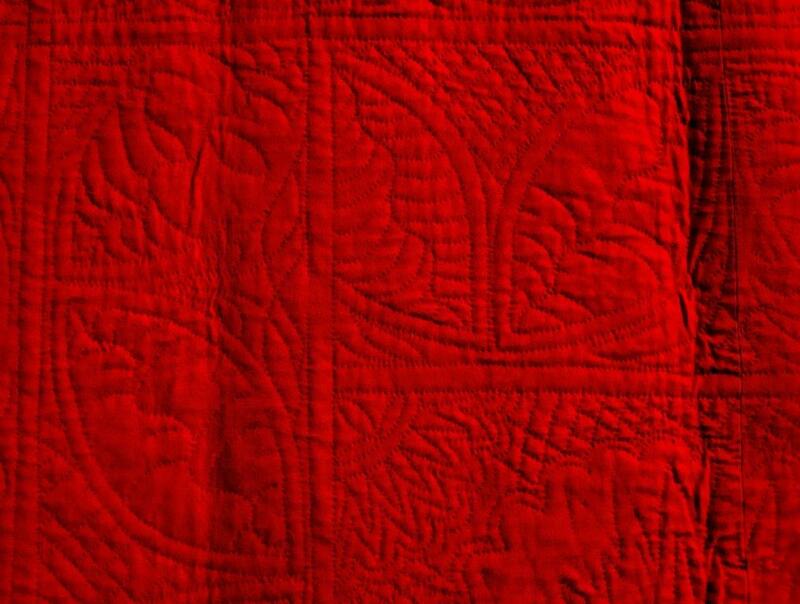 I have researched how quilters in the past approached corner designs, and found that they had other, simpler tactics which were used far more often. Some quilters, such as Mrs Llewellyn the mid-twentieth century stitcher of this broad cable, made no attempt to turn the corner, simply continuing the border design straight to the edge. The next cable just butts up against the first border. A similar tactic was used on the inner border of this late 19th/early 20th century Green & Gold Welsh wholecloth from a farmhouse in mid-Wales, which again simply butts the next border against the first one. “Ignoring the corner” is not just found with cables. 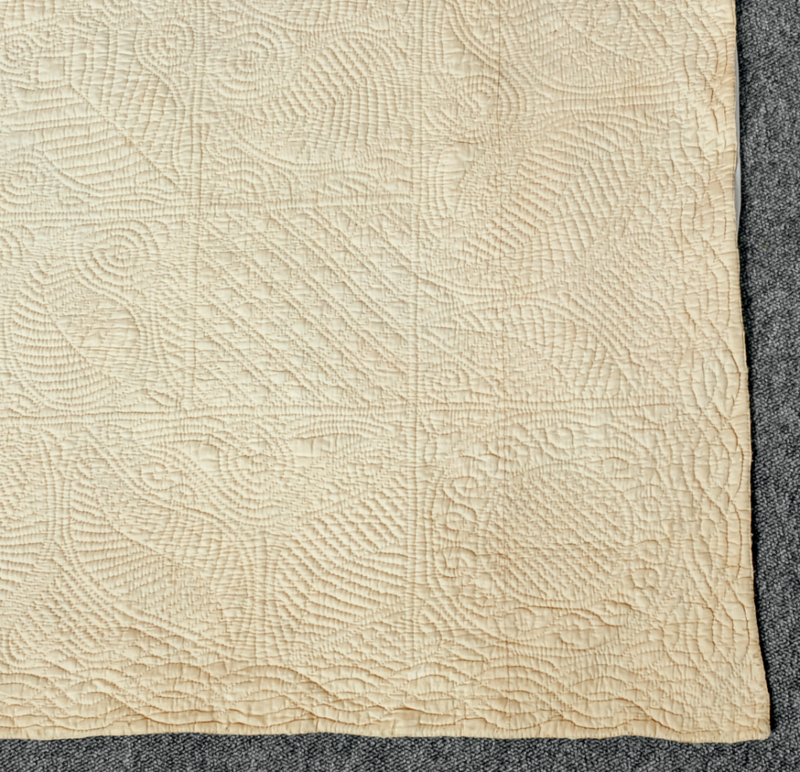 The same treatment is given to the inner border of this slightly later quilt from Gorseinon, near Swansea – although it is a little harder to spot, as the quilter has thought about the size and number of chevrons that will fill the border. 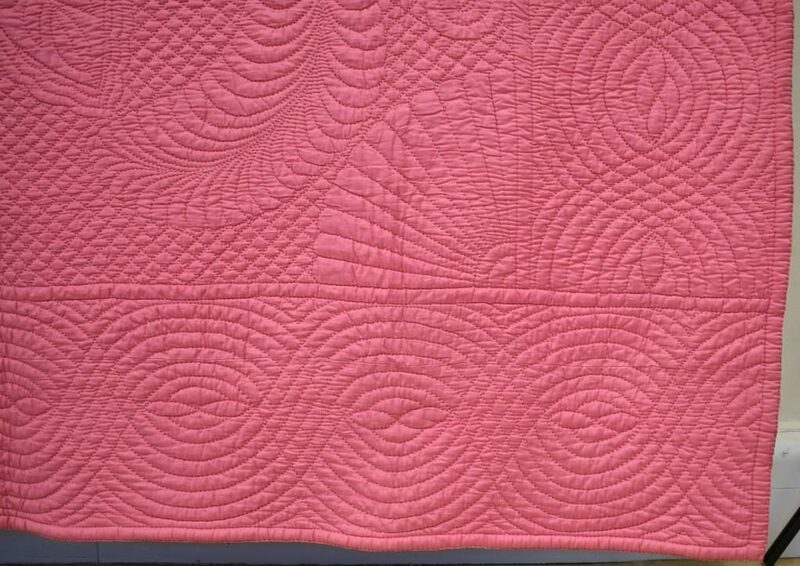 A surprising number of quilts are not quite as perfect as they may initially appear – and the border corners are a classic region where adjustments have been made to make things fit in. 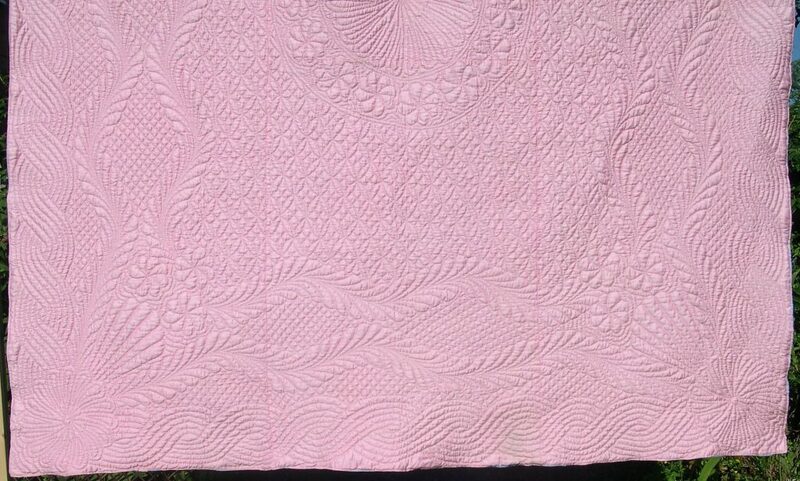 Can you see where there has been a little bit of fudging on the Gorseinnon quilt above? The last chevron on the left border has been squashed a little to get it all in. 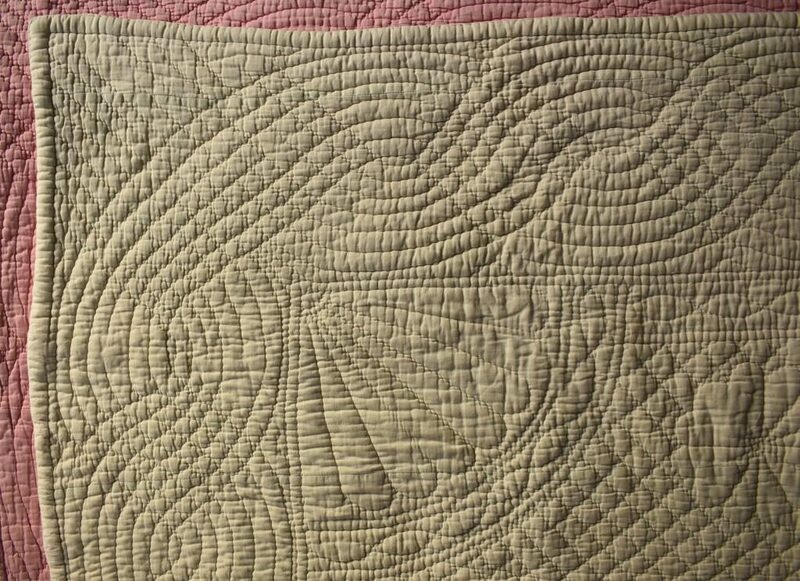 This quilter simply marked round part of her template at the end of the border. Butted corners can be quite well disguised. 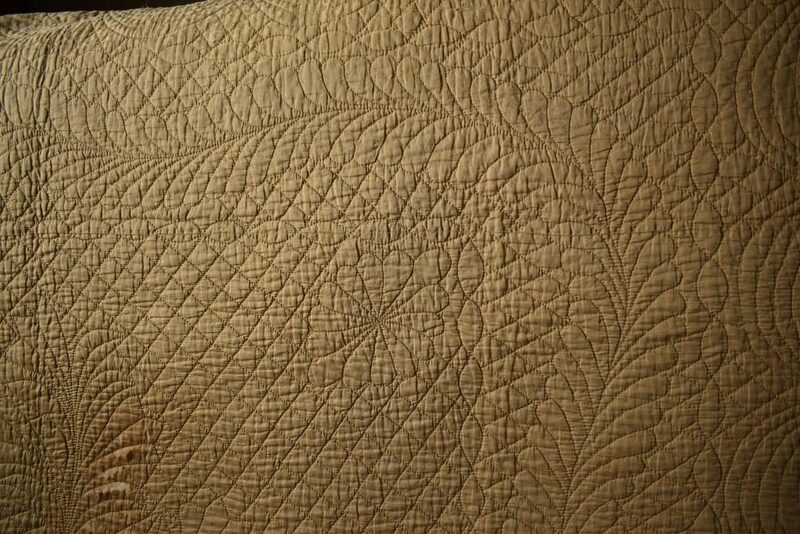 It takes quite close study of this late nineteenth century Pembrokeshire quilt to realise that there are no four leaf corner units – and can you identify the fudging in the sizes of the leaves that has been done to make them fit? 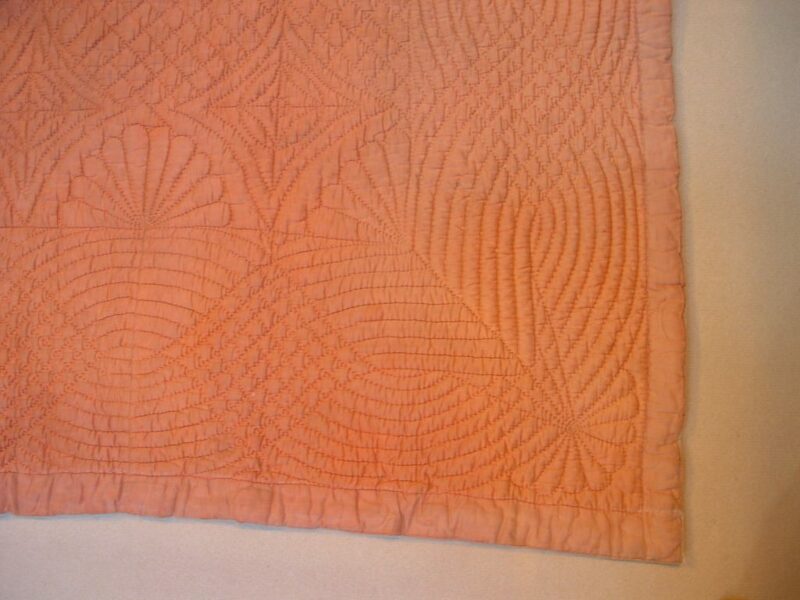 I discovered that the use of a different motif within a lined square at the corner is a very common feature, particularly on Welsh quilts, as seen in the Pink & Gold Welsh wholecloth below, dating from about 1910. 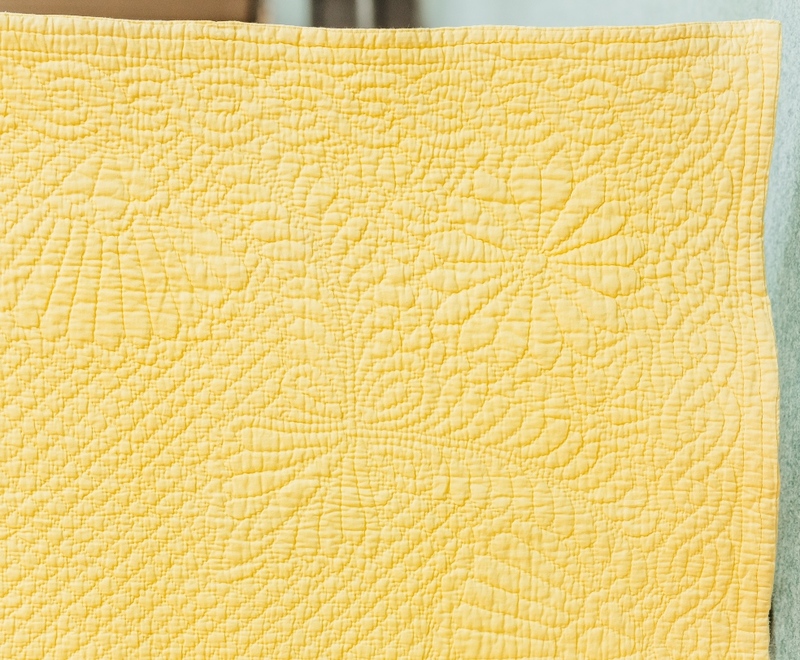 Corner motifs include simple diagonal grids, roses & four-leaf motifs, and their use can be a good way for less experienced quilters to avoid complicated planning. 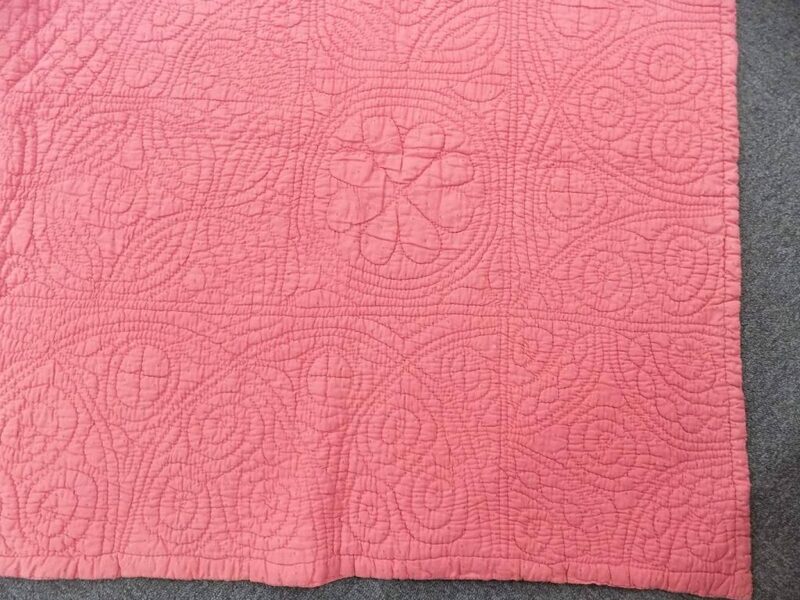 This is a nice example where a pretty corner has been created on this Deep Pink Welsh wholecloth quilt which avoids turning the church windows border. Fudges are common with this “Avoid” sort of corner, too; some more successful than others. The bent leaves on the outer border have been stretched to reach the corner square – an effective fudge; but one of the paisleys on the inner border is only a partial motif. Most quilters at this period would have had a limited amount of mathematical education if any. 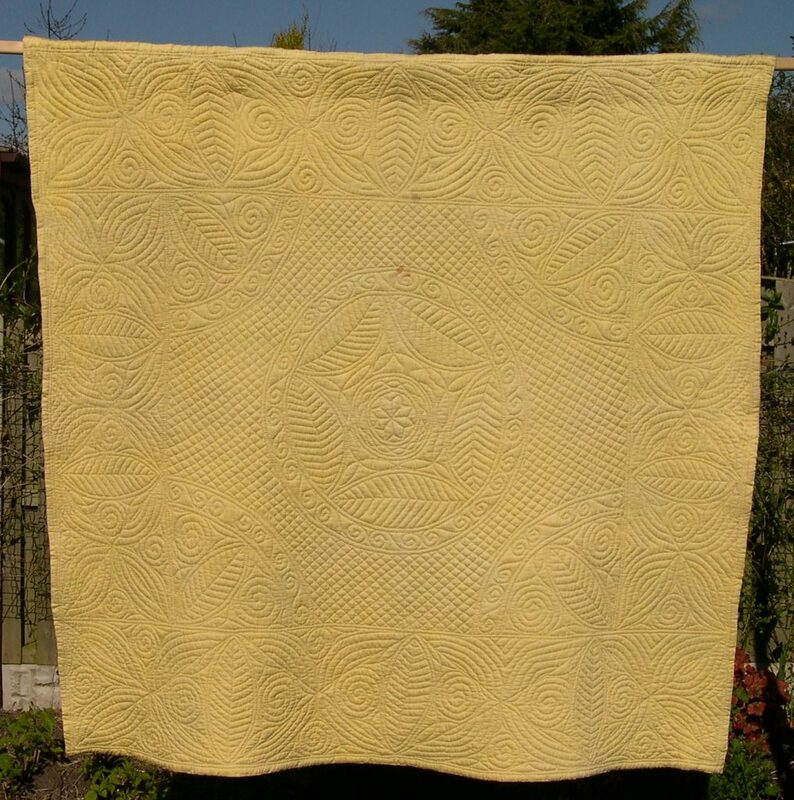 This Yellow Lovers Knot wholecloth has a fan border, but also uses sprays of feathers which swing in from the corner to protrude into the central area. To get this balance and precision the elaborate corners were probably planned first, and then the border motifs fitted into the remaining space. This complex corner treatment is particularly found in the Allendale style developed by George Gardiner and Elizabeth Sanderson. 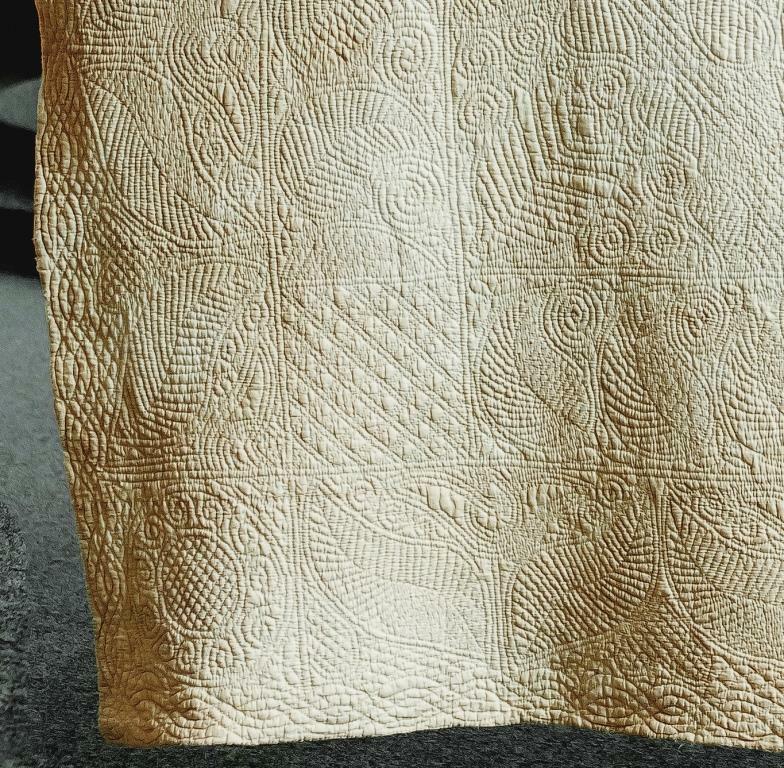 This elaborate style of design needed to be marked on the whole quilt before putting into the frame – it is well known that professional quilt “stampers” designed and marked quilt tops for others to stitch, but the generally improved planning of the borders and corners indicates that this must have been common practice. A circular rose, combined with sprays and lilies in this corner design, fit beautifully in between the goosewing motifs of the border. This was the category that I initially went looking for – where the border design flowed smoothly around the corner. 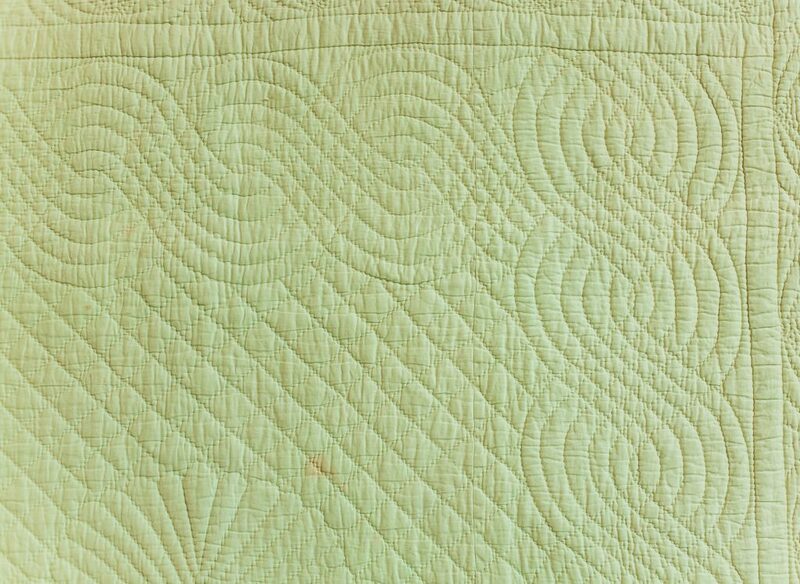 To my surprise, this was by far the smallest category of corner found in the quilts studied – but on reflection, the difficulty of this approach explains its scarcity. Even among those who attempt it, true mastery is elusive. The quilter of this Old Gold North Country wholecloth from the 1920s manages to make the running feather sweep around this corner beautifully – I suspect that she marked this one first. But the other three corners are much more awkward. Mastering a runaround corner is deceptively tricky – it really needs careful planning to achieve the perfection shown by Amy Emms, a Durham quilter who kept the art of hand quilting alive in the North East of England during the twentieth century. 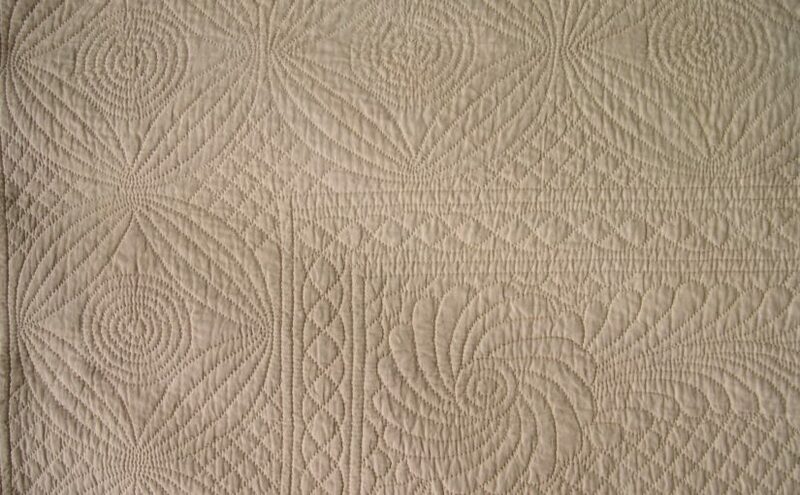 Have a look at the feather cable corner on this beautiful quilt in the Quilters Guild Collection . 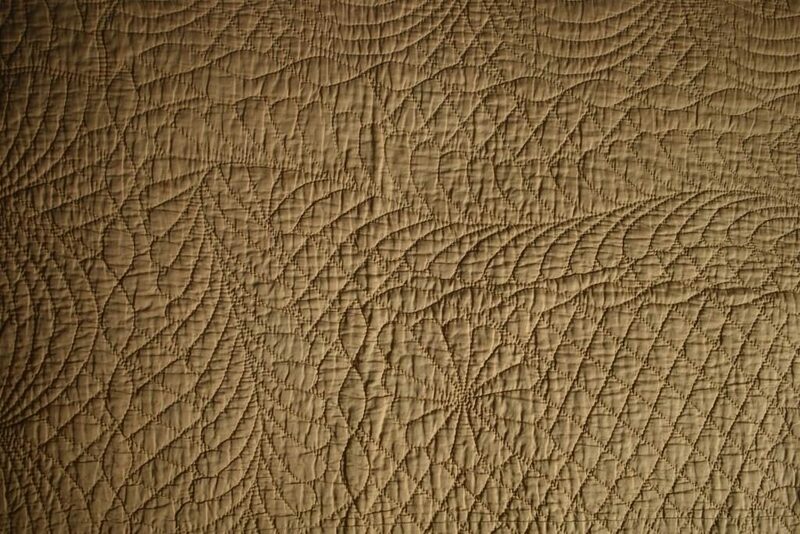 This research was assisted by the award of the Amy Emms bursary, which I received from the Quilters Guild in 2016. 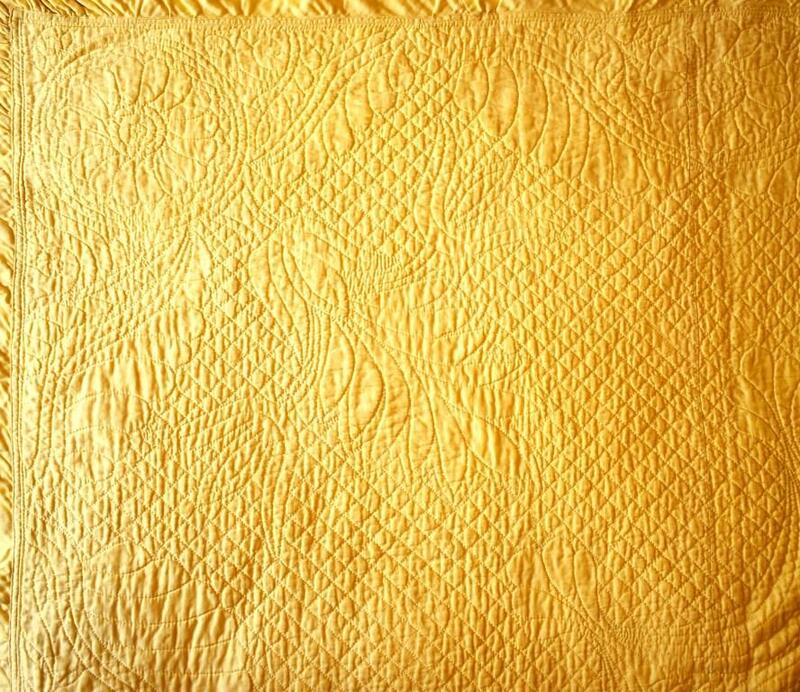 This is awarded every two years to a Guild member who wishes to increase their skills or knowledge of hand quilting. If you would like to know how to draft cable borders with perfect corners, look at the Drafting Cable Borders page in the Techniques section.